There’s something simultaneously nostalgic and child-like about musical jewelry boxes. Whether we owned one as a child, adored the ones belonging to the ladies in our family, or pined after the displays in stores, a quaint little jewelry box, even a non-musical one, is one of those things that charm us when we’re little, and become precious little keepsakes as we grow older. Jewelry cases don’t only hold sentimental value, though. Giving a little girl their own case to organize and keep their knick-knacks is a great way of teaching them responsibility and to value and care for their belongings – with, of course, the added incentive of a charming little wind-up musical box or a bunch of cute nooks and crannies to explore. So which jewelry case should you pick for the special little girl in your life? Here are our top picks. A quaint, quilt-stitch sculpted case with a metallic heart detail at the front, the silver-white of the exterior sweetly complements the soft rose-pink of the interior to pull off an enticingly feminine effect, without being too garish or girly. Segmented into six rectangular compartments to sort your earrings, lockets and other accessories into, there is also a ring tray which can be removed for additional storage space for bigger pieces like bracelets or necklaces. The highlight of this case, though, is the elegant little ballerina figurine which rises up as you lift the lid of the case, rotating to the notes of Beethoven’s Für Elise. With a sturdy, hardy construction contrasting the otherwise delicately ornate look of this case, this musical jewelry box is the perfect gift for the little girl in your life. This is the perfect gift for the young dancer or aspiring ballerina. Small and sweet, this heart-shaped hard-cardboard case features whimsical illustrations of ballet students practicing at barres along the sides, and that of a ballerina accepting a bouquet of flowers on top of the lid, giving the case an almost vintage, timeless appeal. 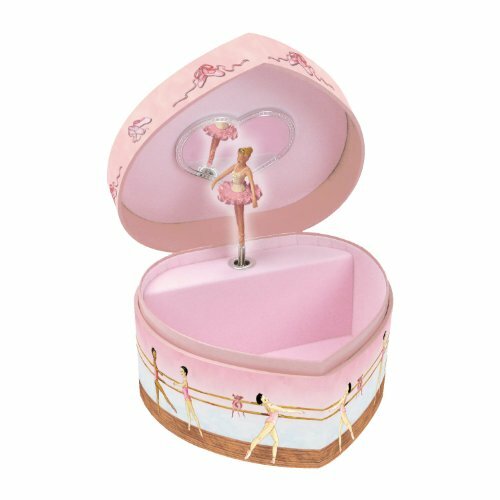 With one main compartment wide and deep enough to let you store a bunch of little trinkets, the case also features the twirling figurine of a ballerina, dancing, appropriately, to the tunes of Swan Lake. The music, once wound, will continue for 4 to 5 minutes. If you’re afraid of picking a case the recipient may grow out of, this is the one to go for. 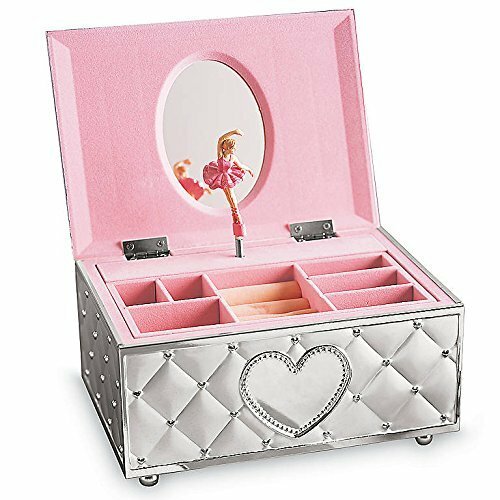 Equal parts sweet and sophisticated, this multi-tiered jewelry case is going to win the hearts of little girls and adults alike, with its soft velvet lining and faux leather detail. Available in three colors, with a black option if you’re looking to get this for yourself and more colorful options in blue and purple better suited to children, this case has 9 compartments to help you store all your jewelry. 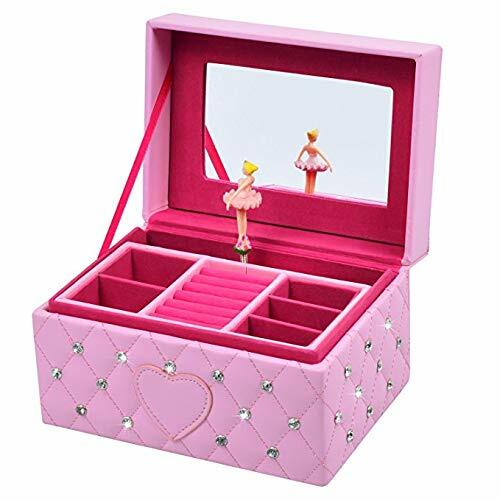 With a pull-out drawer, a ring-tray which slides out as you pull down the front panel, multiple partitioned off segments to keep all your earrings, bracelets and other pieces, and a rectangular mirror to top it off, this case is the perfect incentive both a child and an adult would need to keep their jewelry organised. The box packs up into a classy, sleek carry case that can be taken along for travelling, or playing dress-up at a friend’s house. For the girl that loves pink, this jewelry box comes with a sculpted, quilt pattern embossed with faux diamonds and stitched pink heart at the front. The hinged top reveals a miniature ballerina dancing to the tinkly notes of Twinkle, Twinkle, Little Star, earning extra points for kids who adore nursery rhymes and are likely to be more enthused with music they recognize. The case also comes with a large, rectangular mirror and five, multi-sized compartments to categorize all your trinkets into, as well as a ring tray in the center. Not only does this help keep accessories and other little pieces safe and organised, but the velvet and faux leather construction and wind-up music mechanism ensures this box will last you a very long time. Musical boxes are instant classics for kids and adults alike, but since these are cases we are seeking out especially for children, the very first thing to consider is whether the box comes with any parts that pose a choking hazard, or could otherwise injure a child. Loose parts, compartments or edges made out of metals, or removable elements which come off easily or simply break off, are all safety hazards when used by a child. Another element to look out for, if you’re looking specifically for a musical jewelry box, is to search for a wind-up variety. Battery-operated music boxes can only last so long, and replacing them can be complex depending on how the batteries are secured and how easily they can be switched out. Wind-up musical boxes, on the other hand, if looked after properly, can last a long time and can be passed down or kept as mementos. Since these cases are not intended as toys, and are to encourage the owner to be more organised and responsible with their belongings, a roomy option with plenty of segments to let you categorise and store your trinkets is recommended. 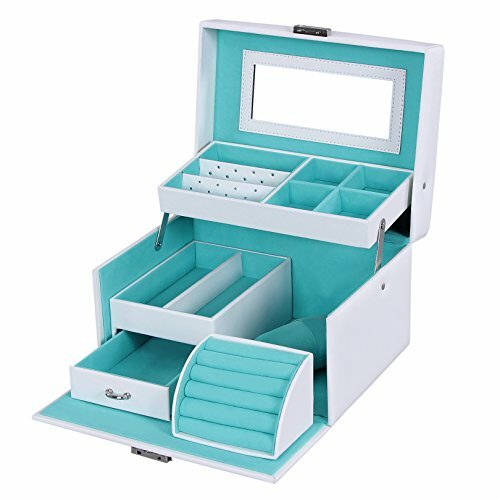 Cases with multiple sections, ring-trays, removeable trays or tiny drawers are not only great to keep your jewelry sorted, but also plenty of fun to explore. Durability is also important – rather than opting for flimsy plastic or collapsible cardboard, cases which have hardy plastic and metal elements reinforced with leather and inlaid with fabric like velvet, not only make for classier cases kids won’t mind keeping as they grow up, but also ensure their longevity over time.